When Orlando signed high-energy forward Brandon Bass last year, they were hoping to gain another athletic body to bolster their front line, help them on the glass and add depth to their bench. Unfortunately the highly sought-after free agent wound up sitting at the end of the bench at first because he didn’t fit into the offensive mold that head coach Stan Van Gundy was using. Hedo Turkoglu and Rashard Lewis could stretch defenses with their 3-point shooting ability, but Bass doesn’t have that kind of range. Bass worked hard to polish up his offensive game and, with Turkoglu gone, Stan gave him some chances to prove himself as the season progressed. Bass performed well and earned Stan’s trust over time, along with more minutes. A consistent mid-range shooter and a solid defender, Bass has become a valuable part of Orlando’s rotation. Last week a virulent case of the flu wiped out a third of the Magic’s roster including Dwight Howard, Jameer Nelson, JJ Redick and Mickael Pietrus. 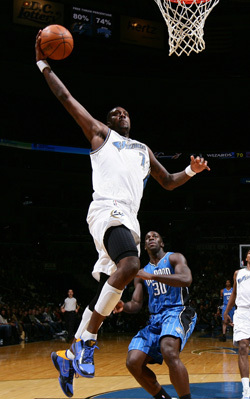 Bass came off the bench and scored 17 points in the Magic’s win over Chicago. He followed up with an impressive effort against Detroit on Friday, hitting 11-of-12 shots for a career-high 27 points to go along with 3 rebounds, 2 assists and 1 block. It’s taken Brandon Bass a little while to fit in, but he’s playing well of late and his numbers are on the rise. Bass is averaging 10.7 points and 5 rebounds per game so far this season. He is logging about 21 minutes per game on average and will earn more court time if he continues to contribute. Tonight Orlando kicks off a four-game week against the Hawks at home before heading out West for a road stretch.